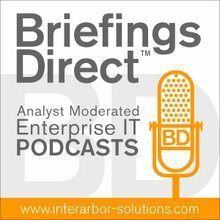 This latest BriefingsDirect panel discussion on converged infrastructure and data center transformation explores the major news emerging from this week's HP Discover 2011 conference in Las Vegas. HP has updated and expanded its portfolio of infrastructure products and services, debuted a mini, mobile data center called the EcoPOD, unveiled a unique dual cloud bursting capability, and rolled out a family of AppSystems, appliances focused on specific IT solutions like big data analytics. We know, for example, that we’ll see most data centers converge their servers, storage, and network platforms intelligently for high efficiency and for better management and security. We know that we’ll see higher levels of virtualization across these platforms and for more applications, and that, in turn, will support the adoption of hybrid and cloud models. In just the past few years, the definition of what a modern IT infrastructure needs and what it needs to do has finally come into focus. We’ll surely see more compute resources devoted to big data and business intelligence (BI) values that span ever more applications and data types. And of course, we’ll need to support far more mobile devices and distributed, IT-savvy workers. How well companies modernize and transform these strategic and foundational IT resources will then hugely impact their success and managing their own agile growth and in controlling ongoing costs and margins. Indeed the mingling of IT success and business success is clearly inevitable. So, now comes the actual journey. At HP Discover, the news is largely about making this inevitable future happen more safely by being able to transform the IT that supports businesses in all of their computing needs for the coming decades. IT executives must execute rapidly now to manage how the future impacts them and to make rapid change an opportunity, not an adversary. Please then meet the panel: Helen Tang, Solutions Lead for Data Center Transformation and Converged Infrastructure Solutions for HP Enterprise Business; Jon Mormile, Worldwide Product Marketing Manager for Performance-Optimized Data Centers in HP's Enterprise Storage Servers and Networking (ESSN) group within HP Enterprise Business; Jason Newton, Manager of Announcements and Events for HP ESSN, and Brad Parks, Converged Infrastructure Strategist for HP Storage in HP ESSN. The panel is moderated by Dana Gardner, Principal Analyst at Interarbor Solutions. Tang: Last year, HP rolled out this concept of the Instant-On Enterprise, and it’s really about the fact that we all live in a very much instant-on world today. Everybody demands instant gr atification, and to deliver that and meet other constituent’s needs, an enterprise really needs to become more agile and innovative, so they can scale up and down dynamically to meet these demands. In order to get answers straight from our customers on how they feel about the state of agility in their enterprise, we contracted with an outside agency and conducted a survey earlier this year with over 3,000 enterprise executives. These were CEOs, CIOs, CFOs across North America, Europe, and Asia, and the findings were pretty interesting. Less than 40 percent of our respondents said, "I think we are doing okay. I think we have enough agility in the organization to be able to meet these demands." So the number is so low, but not very surprising to those of us who have worked in IT for a while. As you know, compared to other enterprise disciplines, IT is a little bit more pre-Industrial Revolution. It’s not a streamlined. It’s not a standardized. There's a long way to go. That clearly spells out a big opportunity for companies to work on that area and optimize for agility. We also asked, "What do you think is going to change that? How do you think enterprises can increase their agility?" The top two responses coming back were about more innovative, newer applications. But, the number one response coming from CEOs was that it’s transforming their technology environment. That’s precisely what HP believes. We think transforming that environment and by extension, converged infrastructure, is the fastest path toward not only enterprise agility, but also enterprise success. Parks: A couple of years ago, HP took a step back from the current trajectory that we were on as a storage business and the trajectory that the storage industry as a whole was on. We took a look at some of the big trends and problems that we were starting to hear from customers around virtualization or on the move to cloud computing, this concept of really big everything. We’re talking about data, numbers of objects, size, performance requirements, just everything at massive, massive scale. When we took a look at those trends, we saw that we were really approaching a systemic failure of the storage that was out there in the data center. The challenge is that most of the storage deployed out in the data center today was architected about 20 years ago for a whole different set of data-center needs, and when you couple that with these emerging trends, the current options at that time were just too expensive. They were too complicated at massive scale and they were too isolated, because 20 years ago, when those solutions were designed, storage was its own element of the infrastructure. Servers were managed separately. Networking was managed separately, and while that was optimized for the problems of the day, it in turn created problems that today’s data centers are really dealing with. Thinking about that trajectory, we decided to take a different path. Over the last two years, we’ve spent literally billions of dollars through internal innovation, as well as some external acquisitions, to put together a portfolio that was much better suited to address today’s trends. At the event here, we're talking about HP Converged Storage, and this addresses some of the gaps that we’ve seen in the legacy monolithic and even the legacy unified storage that’s out there. Converged Storage is built on a few main principles we're trying to drive towards common industry-standard hardware, building on ProLiant BladeSystem based DNA. We want to drive a lot more agility into storage in the future by using modern Scale-Out software layers. And last, we need to make sure that storage is incorporated into the larger converged infrastructure and managed as part of a converged stack that spans servers and storage and network. When we're able to design on industry-standard platforms like BladeSystem and ProLiant, we can take advantage of the massive supply chain that HP has and roll out solution that are much lower upfront cost point from a hardware perspective. Second, using that software layer I mentioned, some of the technologies that we bring to bear are like thin provisioning, for example. This is a technology that helps customers cut their initial capacity requirements around 50 percent by just eliminating their over-provisioning that is associated with some of the legacy storage architectures. One of the things we've seen and talk about with customers worldwide is that data just doesn't go away. It is around forever. Then, operating expense is the other place where this really is expensive. That's where it helps to consolidating the management across servers and storage and networking, building in as much automation into the solutions as possible, and even making them self-managing. For example, our 3PAR Storage solution, which is part of this converged stack, has autonomic management capabilities which, when we talk to our customers, has reduced some of their management overhead by about 90 percent. It's self-managing and can load balance, and because of its wide straightening architecture, it can respond to some of the unpredictable workloads in the data center, without requiring the administrative overhead. Newton: We're really excited about the AppSystems announcements. We're in a great position as HP to be the ones to deliver on a promise of converging server, storage, network, management, security application all into individual solutions. So, 2009 was about articulating the definition of what that should look like and what that data center in the future should be. Last year, we spent a lot of time in new innovations in blades and mission-critical computing and strategic acquisitions around storage, network, and other places. The result last year was what we believe is one of the most complete portfolios from a single vendor in marketplace to deliver converged infrastructure. Now, what we’re doing in 2011 is building on that to bring all that together and simplify that into integrated solutions and extending that strategy all the way out to the application. If we look at what kind of applications customers are deploying today and the ways that they’re deploying them, we see three dominant new models that are coming to bear. One is applications in a virtualized environment and on virtual machines and that have got very specific requirements and demands for performance and concerns about security, etc. Security concerns also require new demands on capacity and resource planning, on automation, and orchestration of all the bits and bytes of the application and the infrastructure. We see a lot of acceleration and interest in applications delivered as a service via cloud. Security concerns also require new demands on capacity and resource planning, on automation, and orchestration of all the bits and bytes of the application and the infrastructure. The third way that we wanted to address was a dedicated application environment. These are data warehousing, analytics types of workloads, and collaboration workloads, where performance is really critical, and you want that not on shared resources, but in a dedicated way. But, you also want to make sure that that is supporting applications in a cloud or virtual environment. So in 2011, it's about how to bring that portfolio together in the solution to solve those three problems. The key thing is that we didn't want to extend sprawl and continue the problem that’s still out there in the marketplace. We wanted to do all that on one common architecture, one common management model, and one common security model. What if we could take that common architecture management security model, optimize it, integrate it into individual solutions for those three different application sets and do it on the stuff that customers are already using in the legacy application environment today and they could have something really special? What we’re announcing this week at Discover is this new portfolio we called Converged Systems. For that virtual workload, we have VirtualSystems or the dedicated application environment, specifically BI, and data management and information management. We have the AppSystems portfolio. Then, for where most customers want to go in the next few years, cloud, we announced the CloudSystem. So, those are three portfolios, where common architecture addresses a complete continuum of customer’s application demands. What's unique here is doing that in a common way and being built on some of the best-of-breed technologies on the planet for virtualization, cloud, high performance BI, and analytical applications. Our acquisition of Vertica powers the BI appliance. The architecture is one of the most modern architectures out there today to handle the analytics in real time. Before, analytics in a traditional BI data warehouse environment was about reporting. Call up the IT manager, give them some criteria. They go back and do their wizardry and come back with sort of a status report, and it's just looking at the dataset that’s in one of the data stores he is looking. It sort of worked, I guess, back when you didn’t need to have that answer tomorrow or next week. You could just wait till the next quarterly review. With the demands of big everything, as Brad was speaking of, the speed and scale at which the economy is moving the business, and competition is moving, you've got to have this stuff in real-time. So we said, "Let’s go make a strategic acquisition. Let’s get the best-in-class, real-time analytics, a modern architecture that does just that and does it extremely well. And then, let’s combine that with the best hardware underneath that with HP Converged Infrastructure, so that customers can very easily and quickly bring that capability into their environment and apply it in a variety of different ways, whether in individual departments or across the enterprise. There are endless possibilities of ways that you can take advantage of real-time analytics with this solution. Including it into AppSystem makes it very easy to consume, bring it into the environment, get it up and running, start connecting the data sources literally in minutes, and start running queries and getting answers back in literally seconds. What’s special about this approach is that most analytic tools today are part of a larger data warehouse or BI-centered architecture. Our argument is that in the future of this big everything thing that’s going on, where information is everywhere, you can’t just rely on the data sources inside your enterprise. You’ve got to be able to pull sources from everywhere. In buying a a monolithic, one-size-fits-all OLTP, data warehousing, and a little bit of analytics, you're sacrificing that real-time aspect that you need. So keep the OLTP environment, keep the data warehouse environment, bring in its best in class real-time analytic on top of it, and give your business very quickly some very powerful capabilities to help make better business decisions much faster. Mormile: When you talk about today’s data centers, most of them were built 10 years ago and actually a lot of our analyst’s research talks about how they were built almost 14-15 years ago. These antiquated data centers simply can’t support the infrastructure that today’s IT and businesses require. They are extremely inefficient. More of them require two to three times the amount of power to run the IT, due to inefficient cooling and power distribution systems. These antiquated data centers simply can’t support the infrastructure that today’s IT and businesses require. They are extremely inefficient. In addition to these systems, these monolithic data centers are typically over-provisioned and underutilized. Because most companies cannot build new facilities all the time and continually, they have to forecast future capacity and infrastructure requirements that are typically outdated before the data centers are even commissioned. A lot of our customers need to reduce construction cost, as well as operational expenses. This places a huge strain on companies' resources and their bottom lines. By not changing their data center strategy, businesses are throttled and simply just can’t compete in today’s aggressive marketplace. HP has a solution: Our modular computing portfolio, and it helps to solve these problems. Our modular computing portfolio started about three years ago, when we first took a look at and modified an actual shipping container, turning it into a Performance Optimized Data Center (POD). This was followed by continuous innovation in the space with new POD designs, the deployment of our POD-Works facility, which is the world’s first assembly line data centers, the addition of flexible data center product, and today, with our newest edition, the POD 240A, which gives all the benefits of a container data center without sacrificing traditional data center look and feel. Also, with the acquisition of EYP, which is now HP Critical Facilities Services, and utilizing HP Technical Services, we are able to offer a true end-to-end data center solution from planning and installation of the IT and the optimized infrastructure go with it, to onsite maintenance and onsite support globally. When you combine in-house rack and power engineering, delivering finely tuned solutions to meet customers’ growing power and rack needs, it all comes together. You're talking about taking that IT and those innovations and then taking it to the next level as far as integrating that into a turnkey solution, which should actually be a POD or modular data center product. You take the POD, and then you talk about the Factory Express services where we are actually able to take the IT integrate it into a POD, where you have the server, storage, and networking. You have integrated applications, and you've cabled and tested it. The final step in the POD process is not only that we're providing Factory Express services, but we're also providing POD-Works. At POD-Works, we take the integrated racks that will be installed in the PODs and we provide power, networking, as well as chilled water and cooling to that, so that every aspect of the turnkey data center solution is pre-configured and pre-tested. This way, customers will have a fully integrated data center shipped to them. All they need to do is plug-in the power, networking, and/or add chilled water to that. Being able to have a complete data center on site up and running in a little as six weeks is a tremendous game changer in the business, allowing customers to be more agile and more flexible, not only with their IT infrastructure needs, but also with their capital and operational expense. When you bring all that together, PODs offer customers the ability to deploy fully integrated, high performing, efficient scalable data centers at somewhere around a quarter of the cost and up to 95 percent more efficient, all the while doing this 88 percent faster than they can with traditional brick and mortar data center strategies. Newton: There are a multitude of professional services and support announcements at this show. We have some new professional services. I call them start services. We have an AppStart, a CloudStart, and a VirtualStart service. These are the services, where we can engage with the customer, sit down, and assess their level of maturity -- what they have in place, what their goals are. These services are designed to get each of these systems into the environment, integrated into what you have, optimized for your goals and your priorities, and get this up and running in days or weeks, versus months and years that that process would have taken in the past for building and integrating it. We do that very quickly and simply for the customer. We have got a lot of expertise in these areas that we've been building on the last 20 years. Just like we're doing on the hardware-software application side simplifications, these start services do the same thing. That extends to HP Solutions support, which then kicks in and helps you support that solution across that lifecycle. There is a whole lot more, but those are two really key ones that customers are excited about this week. Parks: HP ExpertONE has also recently come out with a full set of training and certification courseware to help our channel partners, as well as internal IT folks that are customers, to learn about these new storage elements and to learn how they can take these architectures and help transform their information management processes. Tang: This set of announcements are significant additions in each of their own markets, having the potential to transform, for example, storage, shaking up an industry that’s been pretty static for the last 20 years by offering completely new architecture design for the world we live in today. That’s the kind of innovation we’ll drive across the board with our customers and everybody that talked before me has talked about the service offering that we also bring along with these new product announcements. I think that’s key. The combination of our portfolio and our expertise is really going to help our customers drive that success and embrace convergence.